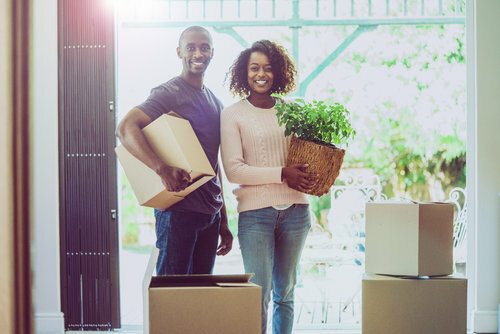 Several long-term economic factors, including the explosion of student debt, are making homeownership a distant goal for most millennials. 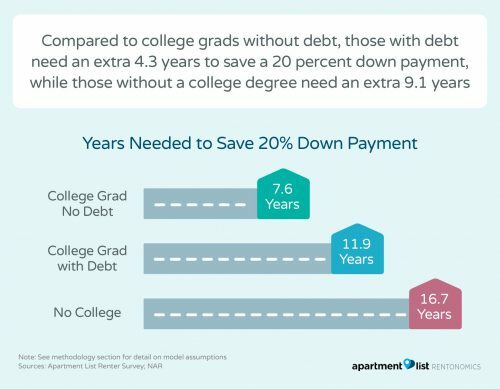 In a new Apartment List report, a renter survey that elicited responses from more than 11,000 millennials across the United States, found that in-debt college graduates aren’t able to save as much for a down payment as graduates without debt, while those without a college degree save even less. The survey results suggest that most millennial renters still have a long way to go before having enough saved to afford a down payment. Those who did not graduate college, including respondents who attended “some college” but did not attain a bachelor’s degree. The findings showed that average college graduate without student loans have $13,900 saved for a down payment, compared to $6,500 for college grads with debt and just $3,400 for those without a college degree. It would take an estimated 7.6 years for the average college grad without debt to save enough for 20 percent down payment on a condo, compared to 11.9 years for college grads with debt and 16.7 years for those without a college degree. Results also showed that all three groups reported that they wanted to achieve homeownership at essentially the same rate, with 79 to 80 percent of each group stating that they planned to purchase a home in the future. Since 1980, the median family income has grown 25 percent when adjusted for inflation. Over the same period, the median home price has grown 60 percent — 2.4 times as much as the income growth. The cost of a college education also has surged in that time, with the average cost of undergraduate tuition growing 6.5 times as fast as the median income, or 160 percent. When discussing the impact of these trends that are making it increasingly difficult for millennials to save for a home, it is important to consider historical context.